“Public-regarding ties that tackle a public issue (e.g., a Parent Teacher Association) vs. private regarding (e.g., a purely social club). Formal (a dues-paying organization with committees and bylaws) vs. informal (a pickup basketball game). Bridging (social ties that cut across differences such as class or ethnicity) vs. bonding social capital (that links people together with others like them). Strong ties (someone with whom you might discuss a serious health problem) vs. weak ties (episodic, and more fleeting ties)”. Different types of social capital are good for different things. For example, weak ties are better for job search, while strong ties are better for social support. However, social capital operates not only on individual, but also on community level. Increasing social capital on community level is very important for the well-being of the society, as it helps to unite people, build sense of trust and empower civic participation. Building a community social capital is a very difficult, yet accomplishable task. 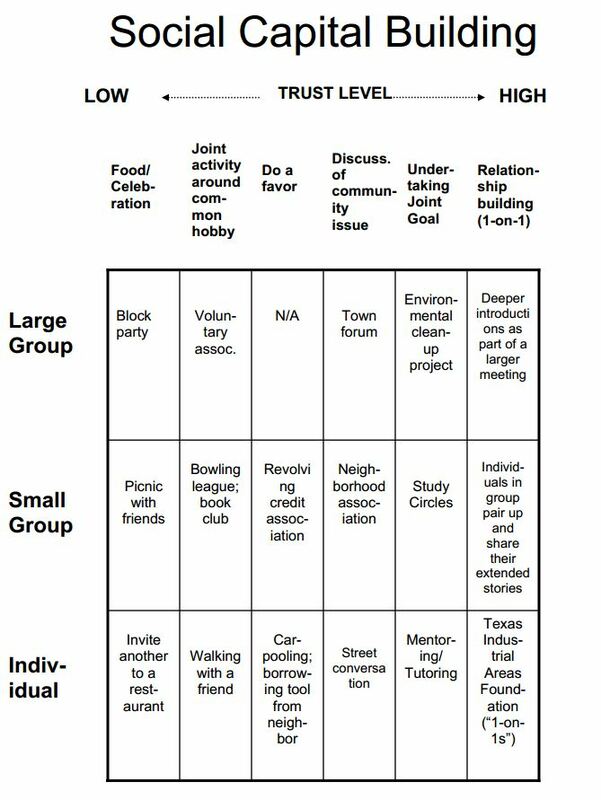 Sander and Lowney propose a matrix of potential building blocks to build more social capital sorted by size of group and level of trust in the community. Putnam and Felstein created a list of 150 actions that can help to increase social capital in the community. They propose to attend town meetings, mentor someone of a different ethnic or religious group or ask a new person to join a group for a dinner, etc. There are also individual initiatives that use gaming experience to improve cooperative behavior and get people to compete on increasing community social capital. 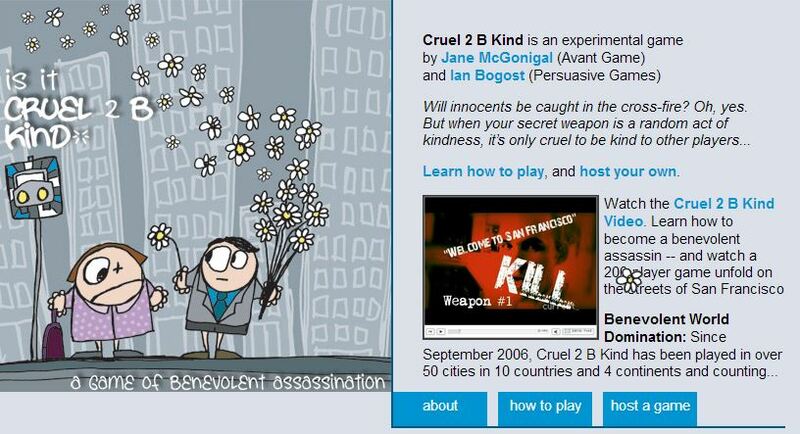 For example, Dr. Jane McGonigal and Dr. Ian Bogost have designed Cruel 2 B Kind, a game in which players advance by being nice to strangers in public places. The game has been played in more than 50 cities on four continents. Another example of such initiative is Sparked: it provides registered users with quests from different nonprofit groups via a special smartphone app. Tierney provides an example of First Aid Corps, organization that creates a worldwide map of the locations of defibrillators available for cardiac emergencies: “instead of looking for magical healing potions in virtual worlds, players scour buildings for defibrillators that haven’t been cataloged yet”. Quite an interesting application of gamification, isn’t it? Posted on March 16, 2014, in COMM506, MACT and tagged community, engagement, gamification, information and communication technologies, social capital, social networks, strong ties, weak ties. Bookmark the permalink. Leave a comment.